BEIJING - A major Chinese supermarket chain pulled baby products made by US-based health care giant Johnson & Johnson from its shelves Monday after allegations that the products contain carcinogens. Shanghai-based Nonggongshan Supermarkets Corp., which operates 3,500 stores in eastern China, pulled the products in response to a debate over the products' safety. "We have to be responsible to consumers and suspend sales of these products until they are proved safe," said Gan Pingzhong, quality supervision department manager of Nonggongshang. Many Chinese have expressed concern on the Internet since the Campaign for Safe Cosmetics, a non-profit US organization, issued an online report on March 12, saying it had found "dozens of top-selling children's bath products are contaminated with the cancer-causing chemicals formaldehyde and 1,4-dioxane." The organization said it tested 48 products from 22 companies for 1,4-dioxane, which is used as a solvent in chemical manufacturing. It also tested 28 of those products for formaldehyde. According to the US National Cancer Institute, formaldehyde is used to make building materials such as plywood, as a preservative in medical laboratories and as an industrial fungicide. It can also be released by burning wood, kerosene, natural gas or cigarettes and may occur in automobile emissions. The institute's website states that formaldehyde is classified as a "probable human carcinogen" by the US Environmental Protection Agency. As for 1,4-dioxane, the US Food and Drug Administration says that it "has not established or recommended a specific limit on the level of 1,4-dioxane in cosmetics." The US Department of Health and Human Services "considers 1,4-dioxane as reasonably anticipated to be a human carcinogen." The Campaign for Safe Cosmetics report said 17 of the products tested contained both formaldehyde and 1,4-dioxane. Two samples of Johnson's Baby Shampoo were tested and both contained formaldehyde at 200 parts per million (ppm) and 210 ppm, respectively. One was also found to contain 1,4 dioxane at 1.1 ppm, it said. Twenty-three of the 28 products tested contained formaldehyde at levels ranging from 54 to 610 ppm. In an e-mail statement to Xinhua Tuesday, Johnson & Johnson said: "The trace levels of certain compounds found by the Campaign for Safe Cosmetics can result from processes that make our products gentle for babies and safe from bacteria growth ... and all our products meet or exceed the regulatory requirements in every country where they are sold." It also said: "We want to reassure parents that Johnson's Baby Shampoo and all our baby and kids' products are safe, gentle and mild products that they can trust and use with confidence." The Personal Care Product Council, a US industry association, said, "The levels of the two chemicals the group reportedly found are considered to be 'trace' or extremely low, are well below established regulatory limits or safety thresholds, and are not a cause for health concern." 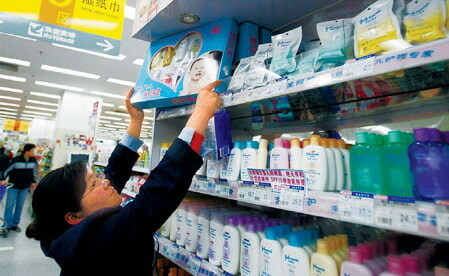 Nonetheless, the news aroused anxiety among parents in China, where Johnson & Johnson has introduced a range of baby products, including baby shampoo, lotion, moisturizer and skin wipes.